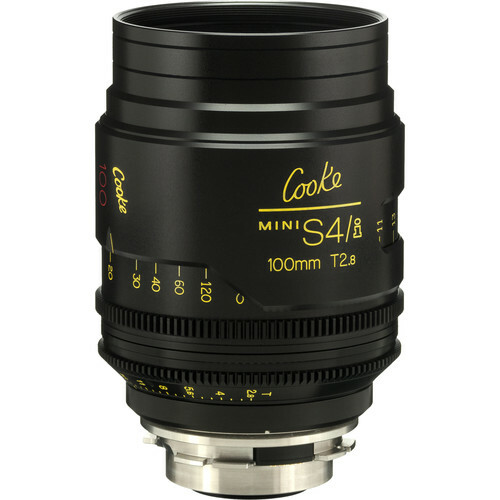 The 100mm T2.8 miniS4/i Cine Lens from Cooke features focus scales marked in feet and is one of a set of lightweight companions to Cooke's already established S4/i lenses. The miniS4i lenses feature an aperture range of T2.8 to T22, while maintaining the same world renowned Cooke image characteristics. This 100mm prime lens features a PL mount, which makes it compatible with most commonly used professional film and digital cinema cameras. Color-matched to intercut with other Cooke lenses, this lens combines classic, hand-fitted construction with a linear iris, cam-style focus, and /i Technology. If you are interested in a more vintage look, Cooke has optional un-coated lenses that you can use to replace the coated optics in your miniS4/1.